Greetings, I am Dawn Henderson, a faculty member in the Department of Psychological Sciences at Winston-Salem State University and a Research Associate at the Center for Community Safety. Program evaluation is a major component of the work that I do and, recently, I have been struggling with the concept of culturally responsive evaluation (CRE). Much of the literature on CRE has focused on the unique cultural traditions and rituals of communities, which is often defined by their ethnic/racial identity. Although this is a major tenet of CRE, I have not had the privilege to read how CRE exist when there is a culture of the organization. So, what happens when you are trying to develop CRE around a target population but it may be impeded by the culture of the organization? Lesson Learned: As a community psychologist I have been trained to view everything as a complex system, which are systems embedded within other systems. I have used this approach in getting organizations to first think about a culture of evaluation with the anticipation they will eventually move towards CRE. Bound the system. Draw the ecological model (Bronfenbrenner, 1977). You really should first understand the culture of the organization before you engage in CRE with target populations. 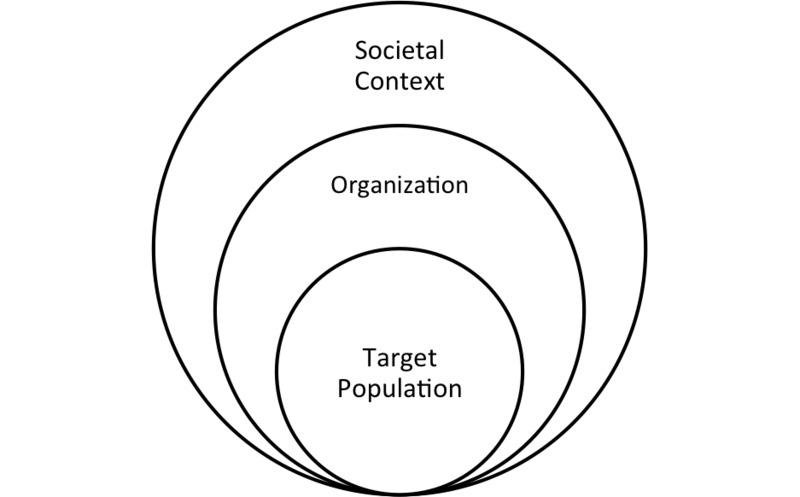 If you target population is at the center, then who are the stakeholders in the organization and what are their current practices and rituals? What external factors govern and drive their programs? Get to know the evaluation culture. If your intentions are to get the organization to CRE then it is important to understand their perspective on evaluation. You should think about targeted the primary members, such as directors, coordinators, the volunteer staff. Ask questions to members like: How do you measure your work? How do you know what you are doing makes a difference? What tools or evidence do you use to say “we are working”? The importance of adaptation. Evaluation requires us to take information and findings and “feed it” back to a system, organization, agency, etc. Evaluators have to be willing to adapt to their environment just as much as anyone else. Therefore, sometimes be willing to adapt your agenda to empower the culture of the organization to think about evaluation and its use. Through the culmination of this process, then you can reengage the organization in moving towards CRE.